A fantastic light deduction game with deceptive depth of strategy and tight, efficient mechanics; slightly marred by ‘unpolished’ looking graphics. Oh My Gods! No, not a game based on the exclamations of teenage girls and The Only Way Is Essex pseudo-celebs, but rather the gods of Olympus. Some cheeky deity has pinched Zeus’ lightning bolt, and of course he’s not happy. It’s up to the players to figure out who the culprit is, with the winner being the first to sleuth it out. That’s the set up, but how does it play? OMG comes with a deck of 20 god cards plus a Zeus card. Apart from Zeus, each god card has one of four Elements (fire or water for example) and one of five Traits (such as spirit or strength). They also each have a unique special ability. 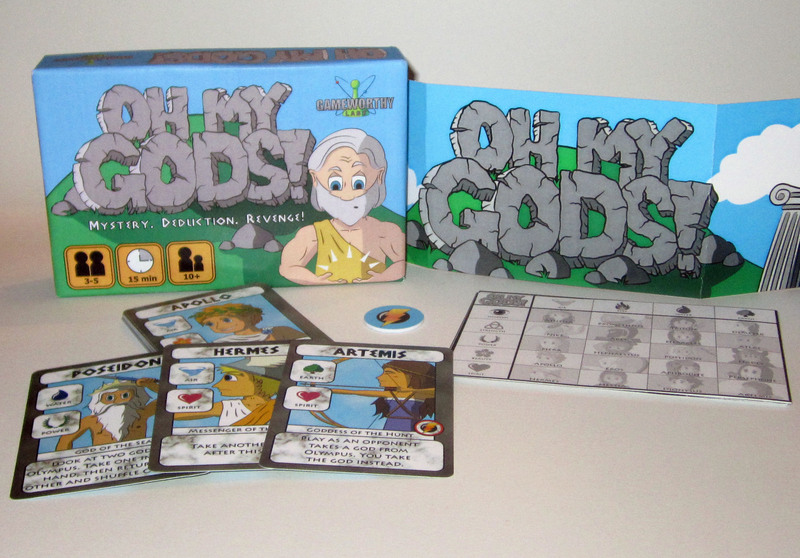 During set up, these gods are shuffled and one put aside as the thief (marked with a little lightning bolt token), whilst a few others are placed face down on the table as ‘gods in Olympus’; at the start of the game no one knows which god is the thief or who is in Olympus. The rest of the gods (including Zeus) are dealt out to the players, with the player receiving Zeus going first. Remember those Elements, Traits and powers? Well, following set up, each player will have a handful of god cards, in addition to a score sheet with all the gods in the game printed on it. During a player’s turn, they must turn to the player on their left and ‘search for clues’ by asking to be shown a god card with a certain Element or Trait. If that player has a god that matches, they show the requester in secret. If they cannot, the request goes to the next player and so on until either someone shows a relevant god card or it gets back round to the requester. The requester then has the option to play a god card from their hand for their special ability. 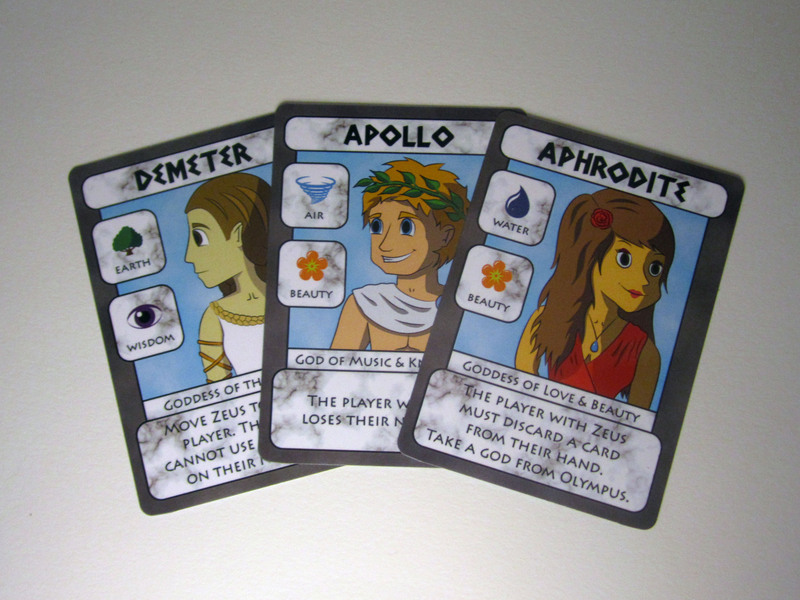 These are all unique to each god with a variety of different actions, such as allowing the player to look at cards in Olympus, steal cards from another player or copy the effects of a god who has already been played. Apart from Zeus, these powers are one-shots; once used, the god card is placed in front of the player so everyone can see their identity. Which sneaky beggar is hiding under that lightning bolt!? 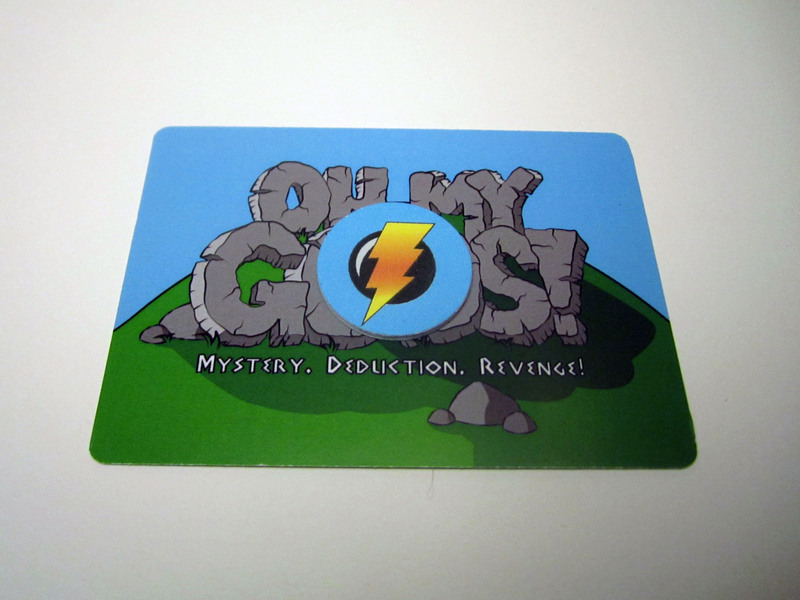 The point of all this as you’ve probably guessed is to figure out who is the thief under the lightning bolt token. The requester mechanic and the score sheet for marking what you’ve figured out is very reminiscent of Cluedo, but without the aggravating roll-and-move nonsense or variable game length. The powers are incredibly useful and add a wonderful strategic element; do I reveal a god card and give away information to the other players, or do I play it in the hope of gaining some additional clues about the thief? It’s a clever mechanic and makes your turn feel ‘meatier’ without bogging you down with analysis paralysis. Different hands every game also improve the replayability of OMG!, another plus point for this mechanic. I did feel however that the powers have varying degrees of usefulness. Some were situational, needing players to have Zeus in front of them, whist others like Dionysus were just crazy-strong (being able to see all the gods in Olympus gives the player a lot of information for one action). In our games, anybody who played this god or could copy him would tend to reach the point of guessing the thief way ahead of the others. This can couple with the random hands of cards to generate situations where one player can get a lot of bang for their buck per god card and just runaway with it. I hasten to add that this is rare, and the powers of the other gods, whilst maybe not as strong can at least be used to mitigate or even negate the more potent god powers. A lot of how you use the cards will come down to your timing, which plays into the surprising depth of strategy OMG! has. Other than this, the game is very tight. It’s clear OMG! has been play-tested within an inch of it’s life. Turns are short and everyone is always engaged as they try to deduce possible options from the guesses of the other players; in effect, down time is nil. At a playtime between 15 and 20 minutes and a small foot print on the table, it’s perfect as a filler, evening finisher or one to play at the pub. Since this was a print and play, I can’t comment on component quality other than the Kickstarter looks to be using materials that you would expect to see for a decent level of tactility and durability. The artwork is unfortunately where OMG! falters for me. The graphics are vivid and engaging, but have an ‘unpolished’ look to them. I appreciate the game is a Kickstarter project and the images look fine for this level, but if I saw this in a shop I reckon I’d pass over this game in favour of more ‘finished’ artwork. This may be a symptom of keeping costs down (at time of writing the Kickstarter has already funded, with a very reasonable goal of $2500) and is certainly functional enough. So OMG! is a clever twist on the Cluedo-esque game, whittling it down to a few compact and efficient mechanics. The game doesn’t outstay it’s welcome with it’s short play time and variety of god cards, and the variable nature of the gods and their powers just adds another wrinkle of strategy to a game that appears deceptively light at first. It’s a perfect gateway game, and has enough meat to engage the hobbyist gamer as a filler or evening finisher. The only let down for me is the graphics, but this is a minor consideration for a game that’s so enjoyable. I thoroughly enjoyed playing this game, and would highly recommend you go check out the Kickstarter! I playtested this game with Bevan and I really enjoyed it too. I’m with him 100% here, the game is a lot of fun and a good length for a quick filler game, but the artwork is my only gripe. Won’t stop me buying the game though, it’s plenty of fun. This review was written by Bevan for Geek Pride, you can see it here.